To improve any budding athlete in any sport, It always good to look at, what I call the 6 Pillars of Health – Mindset, Breathing, Hydration, Nutrition, Movement, Sleep. Optimize all 6 of these, and you would have to agree that the body would respond in a positive manner. However, to improve athletic performance, and in particular soccer, there are 8 areas to look at. So, assuming we are dealing with an un - injured young athlete the areas to focus on to improve athletic performance are - Strength, Power, Speed, Agility, Balance, Coordination, Endurance, Flexibility and how important are each of these areas to improve their soccer game with their current skillset. Obviously, tweaks in training will have to be made between a back, a midfielder and a forward but for now, we can generalize what abilities are most important to improve their performance with the skillset they have right now. Generally, soccer players need all of these 8 abilities however not all of the, are as important as each other. So their program should consist more of improving their speed, agility, power, balance and endurance. Then focusing a little less on their strength and coordination. And even though it has importance, less again on strength and then less on flexibility. NOTE: Although flexibility is not as important as the other abilities, teaching kids to stretch on their own, tailoring specific stretches to them can be taught by sharing the benefits of doing them after a game and at home. So what does this look like in a Strength & Conditioning program? Strengthening the core is the base to build stability and is the platform to build all the other abilities off. If they don't have a strong core, it is much like shooting a canon from a canoe! The best way to improve an athlete’s P, S&A are bounding, box and Speed Ladder drills. 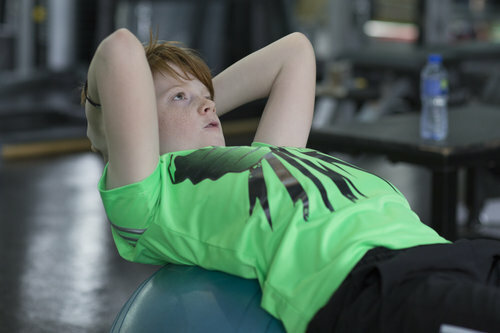 Resistance Training – In the past, weight training has been considered dangerous for kids – that it stunts their growth or easily to hurt themselves but current research is supporting the opposite when resistance training is done correctly, progressively and safely having benefits for kids provided when done correctly. Benefits include injury prevention, stronger bones and muscles, increase in their metabolism, boost in confidence. Stretching muscles that are tight before playing sport and at the end rebalances the body, decreases the aches & pains & reduce the chance of injury. In my experience, children who have been diagnosed with Osgood-schlatters Disease can be alleviated with regular stretching as part of their recovery. In summary, when creating the most beneficial strength & conditioning program for your youth, rate all of their physical abilities needed to play soccer first then allocate the right training for the right amount of time to get the most desired effect. And the best way to know it is working? It will be in their performance.